Facts about Great Pyrenees Dogs, "Scientific name for Great Pyrenees Dog, or domestic canine, is Canis lupus familiaris". Great Pyrenees Dog is also known as the Pyrenean Mountain in North America. The Great Pyrenees Dog is a large breed of dog that is used for guarding livestock. The Great Pyrenees Dog is an old breed of dog that lives in the Pyrenees Mountains of northern Spain and southern France. Great Pyrenees Dogs sweat glands are between their paw pads. It is a Fact a Great Pyrenees Dog sees in color and have better low light vision. Great Pyrenees Dogs have three eyelids, a lower lid, an upper eyelid lid and a third lid, that is called a haw or nictitating membrane, this keeps the Great Pyrenees Dogs eye protected and moist. Great Pyrenees Dogs eyes have a special membrane for seeing better at night, called a tapetum lucidum - a dogs reflective layer in the choroid chiefly of nocturnal, causing the eyes to glow when light at night hits the eyes and they consist of some layers of smooth flat cells covered by a section of double deformed crystals. The average height of the male Great Pyrenees Dog is 27 to 32 inches (68.5 to 81.3 cm). The females average height is 25 to 29 inches (63.5 to 73.6 cm) and some Great Pyrenees Dogs can grow as tall as 39 inches (99 cm). The average weight of the males are from 100 to 125 pounds (45.3 to 56.7 kg) Females from 85 to 105 pounds (38.5 to 47.6 kg). Great Pyrenees Dog was created to be agile for the purpose of guarding sheep on the slopes of steep mountains. 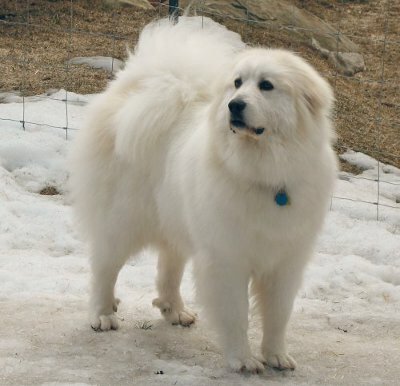 The Great Pyrenees Dog was developed to guard flocks together with shepherds, but today, Pyrenees usually works with people, mainly in rescue work and therapy. The Great Pyrenees Dog is an intelligent dog that figures things out of own self consciousness and likes working on its own, hence giving it a wonderful trait. Since it has a mind of its own, it creates some training challenges and therefore, it’s mandatory to train the Great Pyrenees Dog, or else, it will become totally uncontrollable and because of this, the Great Pyrenees Dog is not recommended to be owned by someone who is reluctant in putting in the necessary time. It has abilities to determine who is a friend from a foe and besides; he is courageous and very loyal to his family and can protect those it loves with its own life. Inside the house the Great Pyrenees Dog is calm and somehow manages not to get underfoot. Many people tend to feel safe having the Great Pyrenees Dog in their homestead and its worth to inculcate that it is a dog who needs a lot of socialization that begin as early as possible, failure to that, it can turn out to be aggressive or fearful and he may fail to allow visitors to get into your yard with or without your permission. Female dogs are in heat for matting for about 20 days twice a year. Female Great Pyrenees Dogs are pregnant for 60 days before they’re puppies are born. A Great Pyrenees Dog is an omnivore, (definition-they eat both other animals and plants). All Dogs are direct descendants of wolves. Great Pyrenees Dogs pant to keep cool with 10 to 35 breaths per minute with an average of 24 breaths per minute. A large dog breed resting heart beats between 60 to 100 times per minute, and a small dog breed’s heart beats on average between 100 to 140 pant a lot. Everyone who lives with the Great Pyrenees Dog should have a couple of ear plugs. The Great Pyrenees Dog is noisy since it barks a lot towards pesky intruders and will bark even more during the night because of his outstanding senses of light and sound, which enables it to sense coyotes, deer, wolves, raccoons, possum and bear, of which are the predators. The vocal styling of the Great Pyrenees Dog will scare them away definitely and keep the property and family safe. The Great Pyrenees Dog is a social guy when brought up in a rightful way, it is active and enjoys playing with all breeds of dogs. The Great Pyrenees Dog loves children and for this reason, it is recommended to give it much exposure to them and you can take it to nursing homes once he is trained. The Great Pyrenees Dog enjoys the sport of carting and going for rides in the vehicle and since he loves cool weather, it is up to you to make sure the air-conditioner of the car is on high during summer days. Unlike other dogs, Great Pyrenees Dog has double dewclaws that they uses to climb as part of its protection services. Great Pyrenees Dogs have two times the amount of ear muscles than people. It is a fact a Great Pyrenees Dog can hear a sound at four times the distance of a human. Sound frequency is measured in Hertz (Hz) Def-Hertz is the measurement of frequency, explicitly it's one cycle per second. The higher the Hertz are, the higher the pitched the sound is. Great Pyrenees Dogs hear best at 45,000 Hz to 65,000 Hz, while humans hear best at around 20 Hz to 20,000 Hz. Great Pyrenees Dog’s nose prints can be used to identify them, their nose prints are like a humans finger print. It is a Fact a Great Pyrenees Dog smells more than 1,000 times stronger than that of a human. A Great Pyrenees Dog’s nose, secretes a thin layer of mucous that helps it absorb scent, after that they lick their noses and sample the scent through their mouth. The Great Pyrenees Dog is an excellent breed who is hardworking, gentle, affectionate, independent and poor in hiding emotions. Great Pyrenees Dog can be a conscientious family companion or a devoted career dog. Its self respect is evident in the right way he carries itself. Make no mistake, since it has a job to execute, and it loves to do it. The number one heath problems amongst Great Pyrenees Dogs is obesity, so always make sure your Great Pyrenees Dog doesn't get to fat. Many foot problems that Great Pyrenees Dogs have are just an issue of long toenails. When purchasing a Great Pyrenees Dog from a breeder, make sure to find a good breeder with references, check at least two to three of the puppies that were purchased from this breeder. The Great Pyrenees Dog belongs in the working Group of dogs and was recognized by (AKC) American Kennel Club in 1933. All dogs are identical in makeup big or small– 42 permanent teeth and 321 bones. Great Pyrenees Puppies have 28 teeth and when they become adult Great Pyrenees Dogs they have 42 teeth. When Great Pyrenees puppies are born, they have no teeth and are deaf and blind. Great Pyrenees Puppies for their first few weeks will sleep ninety percent of the day and their vision is not fully developed until after the first month. A Great Pyrenees Dog’s mouth can apply approximately 150 to 200 pounds of pressure per square inch and an American Pit Bull Terrier, German Shepherd Dog and a rottweiler can have 320 LBS of pressure on avg.